The arms are drilled at 30mm intervals to allow flexible mounting of the landing legs, and a variety of other equipment such as video transmitters, mini cameras, LED strips and camera mounts. With the motor and frame centre mount holes also at 30mm spacing, the arms can also be easily cut in 30mm sections to allow the user to change the rotor diameter of the frame to their own preference. There is room for most common power distribution boards to be mounted at the centre fo the frame, although mounting holes for these are not pre drilled as the exact mounting hole spacing varies from board to board. 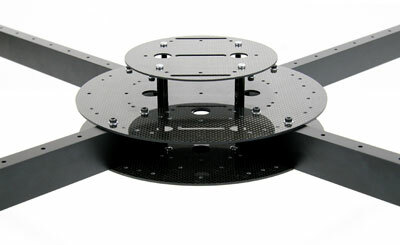 As with most high end muticopter frames, the MultiFrame uses highest quality Carbon Fiber as the main construction material for it's well known strength and light weight, and we have carefully chosen our material weave and thickness to provide the stiffness, rigidity and durability needed for a heavy lift machine. Unusually we decided to use aluminum alloy for the construction of the arms. Carbon Fibre is very strong in certain directions, and when it comes to any kind of hollow tube, it has great longitudinal strength, but is very easy to crush. 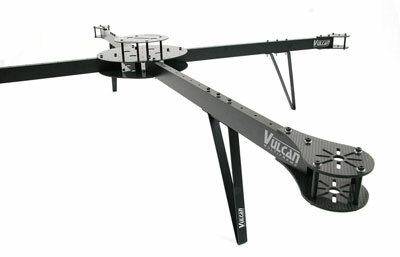 To mount a Carbon Fibre arm, an internal brace, sleeve or spacer must be used, or a friction mount that presses evenly around the entire outside of the tube. Although it is possible to crush the aluminum alloy arm section, it has much greater strength in this direction making straight through bolt mounting possible. The MultiFrame arm section is custom moulded from quality aluminum alloy with a wall thickness not normally available in this type and size of moulding, allowing it to provide the required strength with light weight, as well as minimise vibration transmission.